Lot Detail - Armless—Legless Wonder. Wyatt, Snap. 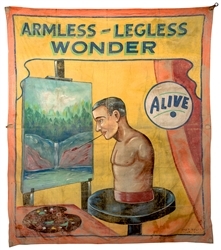 Armless—Legless Wonder. Tampa: Snap Wyatt Studios, ca. 1950. Large canvas sideshow banner depicts the subject painting a canvas of his own by holding the brush in his teeth. 138 x 116”. Worn from use, but intact and good condition overall.